When eating three meals a day was the norm, grabbing a bag of chips or a packaged granola bar was considered a satisfying snack. But now that a more flexible “anywhere, anytime” eating style has taken root, snacks have become a menu category that demands attention from restaurants. Technomic’s 2018 Snacking Occasion Consumer Trend Report reveals that 80% of consumers say they snack at least once a day, and 57% say they snack twice a day or more. 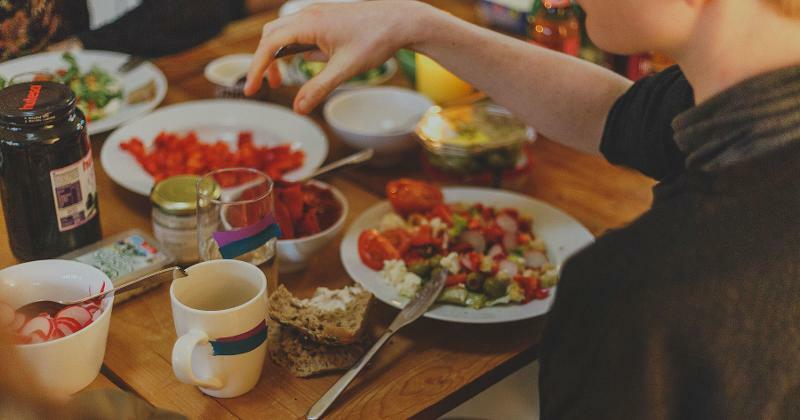 Additionally, their definition of a snack has changed to include a wider variety of foods, and consumers—especially millennials and Gen Zers—are increasingly replacing meals with snacks. To profit from this trend, operators in both limited-service and full-service restaurants are expanding their snack offerings, even creating entirely new snack menus—sometimes labeled with catchy names to hook customers. Here’s a roundup. Yard House revamped its menu to add a 10-plus-item Snacks section. Included on the roster are deviled eggs with candied bacon; street tacos; crispy Brussels sprouts and potatoes; and hot and spicy edamame. Prices range from $4.95 to $6.75. 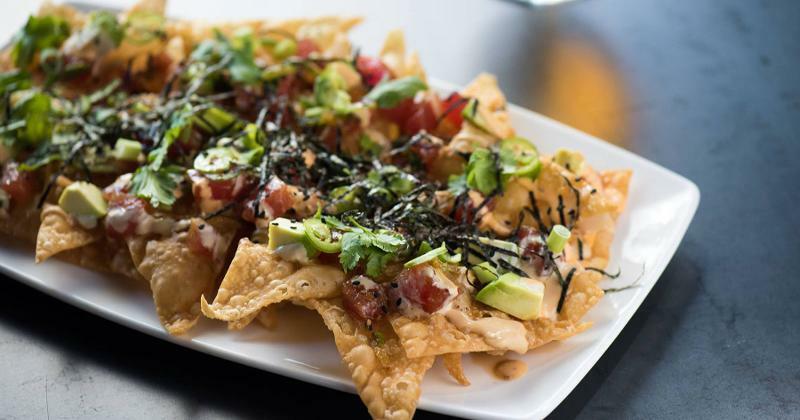 Yard House still has an extensive Appetizers section as well, featuring higher-priced shareables such as poke nachos, chicken lettuce wraps and quesadillas ($9.95 to $13.75). The new Capital Burger, an offshoot of Darden’s Capital Grille, dispensed with an appetizer category all together, heading straight to a menu section labeled Snacks. Prices range from a low of $5 for hand-cut fries and housemade BBQ potato chips to $16 for lobster and crab cakes. In between are some typical starters, such as tomato soup and tuna tartare. Another casual-dining chain that recast some of its appetizers into snacks is Houlihan’s, which renamed the menu section Social Snacks at a number of locations. 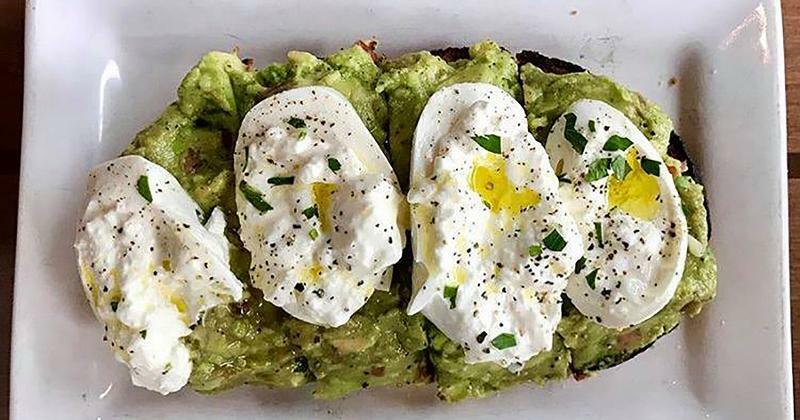 The lineup includes items such as pan-fried pork dumplings, beet chips with dip and burrata-avocado toast—all designed to be shareable to promote sociability. The chain noticed an uptick in traffic from 2-5 p.m., so the kitchen developed the menu to target the between-lunch-and-dinner customer. 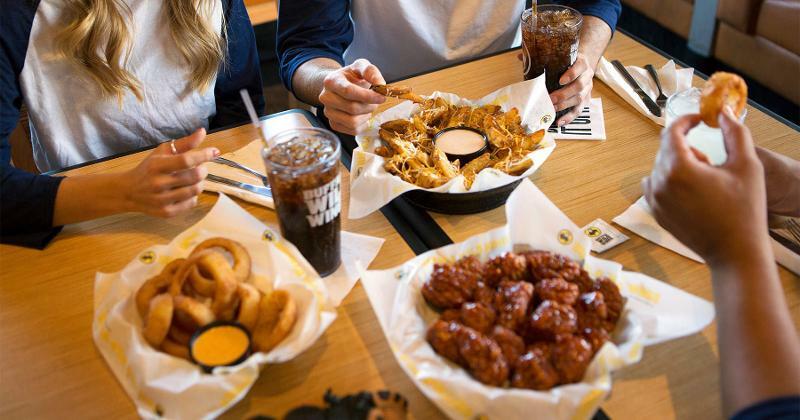 While a number of restaurants encourage sharing on their snack menus, Buffalo Wild Wings boldly calls the section Sharables, using an unconventional spelling of the word. This new menu includes sampler plates of the chain’s signatures, such as boneless wings, chili-cheese fries, spinach-artichoke dip and fried pickles. Guests can also order their favorite snacks solo from a 22-item Sharables selection that includes chili queso dip, mini corn dogs, roasted garlic mushrooms and a soft pretzel with cheese dip. 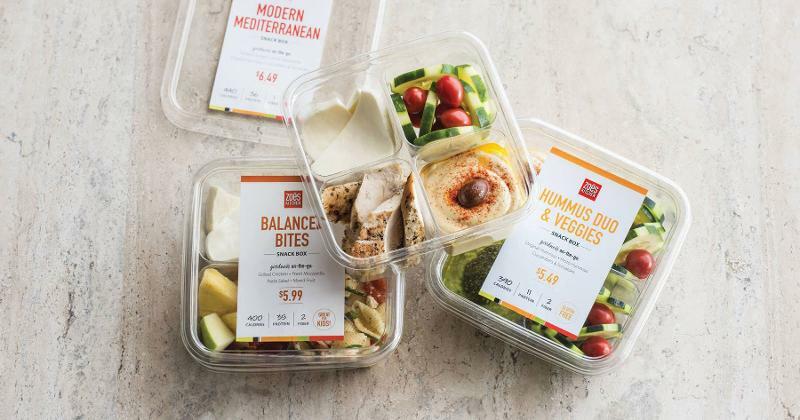 With an eye toward healthy snacking, Zoes Kitchen launched a line of snack boxes to go, packed with ingredients such as hummus, veggies and cheese. One of the boxes, dubbed Balanced Bites, combines snack-size portions from several food groups; its four compartments are filled with grilled chicken, fresh mozzarella, pasta salad and mixed fruit. The boxes sell for $5.49 to $6.49. Fazoli’s capitalized on the popularity of its signature breadsticks for its new line of Breadstick Snacks. 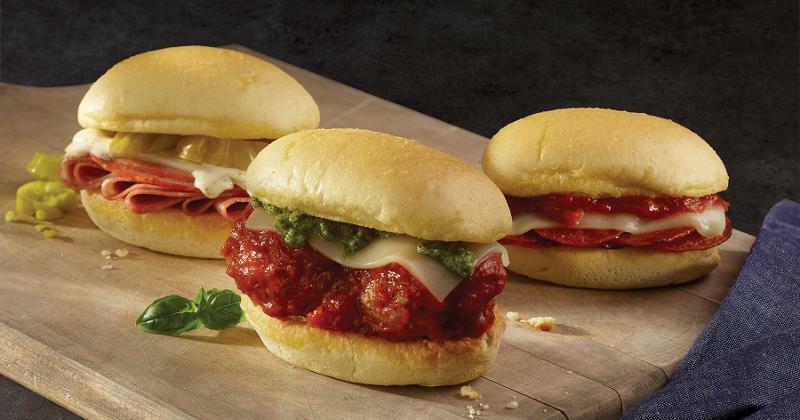 The chain’s garlic breadsticks are shaped into small rolls for a trio of sliders—smashed meatball, pizza and spicy Italian ($1.99). The lineup also includes a mini pizza on a pull-apart breadstick crust topped with pepperoni ($2.49). According to Fazoli’s, customers are adding the bite-size snacks to orders as well as purchasing them separately to go. The word “bites” is being used by both fast-casual and more upscale operators to delineate a snack menu. 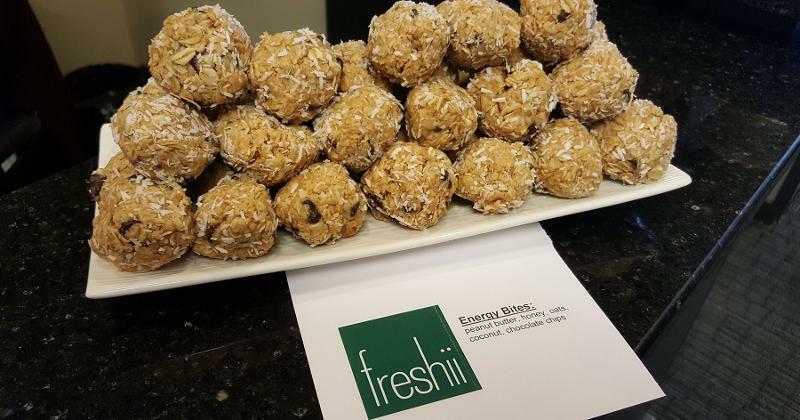 Health-focused Freshii offers protein-rich Energii Bites to grab and go, made with peanut butter, oats, honey and coconut. Morton’s The Steakhouse has an extensive Bar Bites menu, featuring items such as mini crab cake BLTs, iceberg wedge bites, blue cheese steak fries and mini cheeseburgers. Prices start at $7, and unlike many other bar snack menus at steakhouses, this one is available anytime—not just during happy hour.